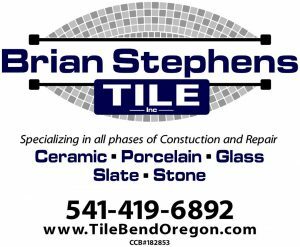 Brian Stephens, owner of Brian Stephens Tile, Inc.
Brian Stephens, owner of Brian Stephens Tile, Inc., in Bend, Ore., has been in the trade since 1993. 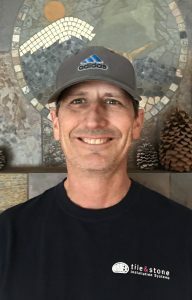 Ten years after starting his own business in 2008, he decided to up his game by testing his skills with the Certified Tile Installer (CTI) exam. Stephens took the exam at the ARDEX facility in Stockton, Calif., on July 27, 2018. It was offered after a tile class Stephens had signed up to attend. “I loaded my tools including my old trusty Target saw (good luck charm) and drove eight hours south,” he said. Stephens also learned that he still has the passion and the skills to be a competent installer. 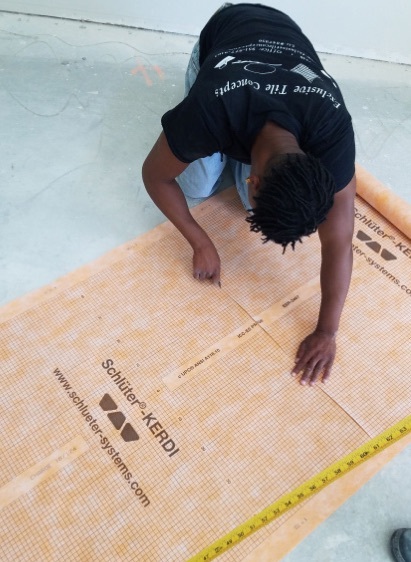 Stephens would be interested in the Advanced Certification for Tile Installer (ACT) exams as well when they are offered locally to his area. He encourages others to go for certification. Jonathan Burton got his start in the trowel trades the way many did in the 1970s. Unlike most of his 13 siblings, and despite pressure from parents, he wasn’t interested in college. “I did my 12, I’m done,” he said. “I’m just going to go to work and raise a family” was his plan. But his dad made it clear that getting any old job wasn’t an option. If not going to college, his dad demanded he learn a trade. Johnathon Burton started down the road to the tile trades at the urging of his father. So Burton joined a friend who was going into carpentry on a tour of the nearby trade school. Intimidated by the math skills required for carpentry, Burton gravitated to the masonry program. “Little did I know masonry has just as much,” he chuckled. And thus, a future journeyman tile setter and tile contractor started down a career path born out of some magic combination of misperception, lack of direction, and parental interjection. Fast forward 30 years and Burton can name dozens of people working in the tile trade in southern California whose careers probably would have been something else had their paths not crossed with his. Some probably wouldn’t have a career or even a job at all, he said. Recognizing so much of his younger self in the many young people he’s encountered in decades of church involvement, Burton takes every opportunity to suggest to young men and women a career in tile or masonry. “For some reason everywhere I go I end up talking about the trade,” said Burton. But it isn’t just talk. He exposes young people to the trowel trades any way he can. 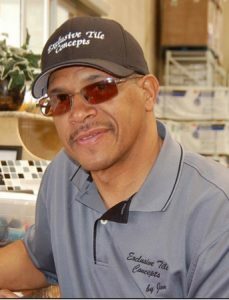 He created and ran a trowel trades workshop at one church he attended, and he has trained through his own company, Exclusive Tile Concepts, for years. Sometimes they’re interested on their own and sometimes they get a push from their parents, says Burton, who knows that feeling well. 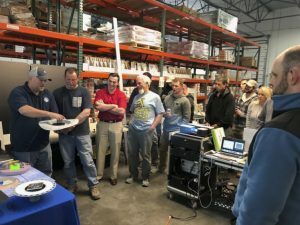 Recently, Burton held a four-hour informational event at his shop, a mix of general information about the trade and hands-on stations for demonstrations and participation. Borrowing from his approach, others can look for similar ways to connect the dots. Burton gets immense fulfillment when he can transfer some of his passion for trowel trades to a young person who hasn’t yet figured out their path, particularly in connection with his youth ministry work. Jonathan Burton (left) of Exclusive Tile Concepts in Riverside, Calif., exposes young people to the trowel trades any way he can. But there are young people everywhere looking for their thing, and not-so-young people looking for their new thing. To connect the dots in your area, step back and look for opportunities to do so. Are there career fairs at your local schools or exhibit halls? Can you develop an age-appropriate activity or presentation for your kids’ social or school groups? Can you post something on social media, welcoming interested people (and their kids) to contact you to talk or even visit some jobsites with you? 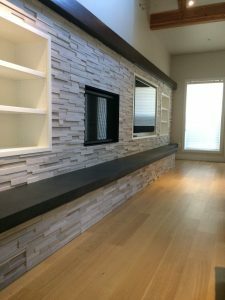 Burton created and ran a trowel trades workshop at one church he attended and he has trained through his own company, Exclusive Tile Concepts, for years. Recently, Burton held a four-hour informational event at his shop, a mix of general information about the trade and hands-on stations for demonstrations and participation. He promoted the event with a postcard-sized flyer at high schools and churches. Can you do something like this at your shop? Next, take inventory of what you love about the trade, the most fulfilling aspects for you, and develop that into talking points. Burton promotes the active aspect of the job, and the reward and fulfillment of seeing the finished work. Even over the phone, his optimism and energy are infectious. He’ll talk to you about tile as long as you want. And consider this: If someone asked you right now why they should consider going into the tile trade, what would you say, and how would you say it? In other words, what’s your pitch? Please share it with us at [email protected], and it may form the basis for a future Training & Education article in TileLetter! 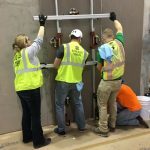 In 2018, NTCA rolled out its program of Regional Training events, with special programs designed for its NTCA Five-Star Contractor Members. In the late fall, two NTCA Five-Star Regional Training events took place, presented by NTCA Training Director Mark Heinlein. 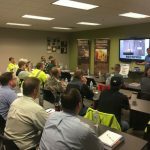 The first program was unveiled at Grazzini Brothers & Company, Eagan, Minn., one of the largest union contractors in the country, as well as a NTCA Five-Star Contractor. 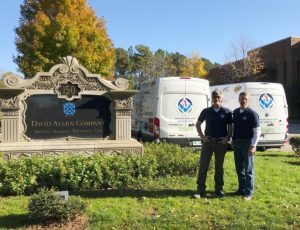 A couple of weeks later, Mark delivered the program to the expansive commercial contractor David Allen Company in Raleigh, N.C. Both of these programs were met with great enthusiasm, and brought essential information to tile setters, foremen, and office staff of these companies. 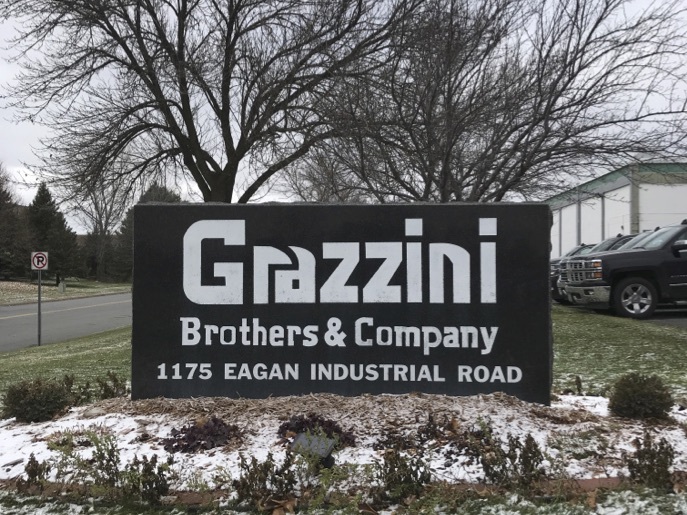 At Grazzini Brothers & Company, it’s important to note that the program served as key complementary training to the skills union contractors learned as part of their union apprenticeships. 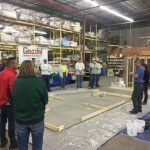 “Even quality tile setters trained in formal apprenticeship programs need to participate in educational workshops and training programs, especially because the technology in our industry is vastly different than when they were trained in proper tile installation,” said NTCA Executive Director Bart Bettiga. Grazzini Brothers Project Coordinator Steve Olson gave the program high marks. He called the classroom portion of the program “invaluable because it helped me become more familiar with a resource that I use almost every day: the TCNA Handbook. When putting together a bid it is critical to investigate the specified setting methods. In many specs the setting method contains components that aren’t listed or shown elsewhere, making it easy to miss items you will be on the hook for later. 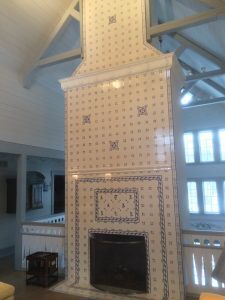 But that’s not all – the hands-on portion of the program also opened Olson’s eyes about correct ways to install tile. 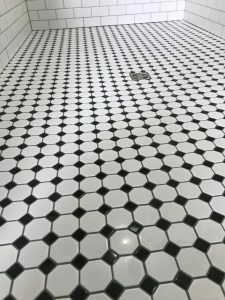 “Having started out working in the office, I have very little field experience with tile,” Olson said. 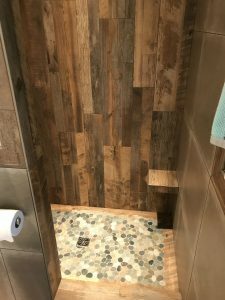 “This meant that while I knew the business side of a tile job, I only knew the basics of how the tile was installed in the field. Kristin Simon, who works in the Grazzini Brothers & Company office, also benefited from the training. “The classroom portion of the day included several things that directly apply to my daily work,” she said. 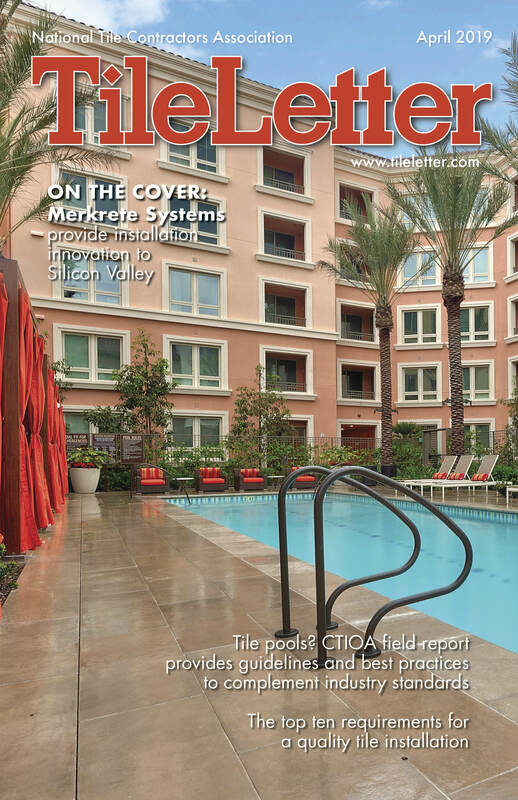 “Several definitions regarding tile were clarified. 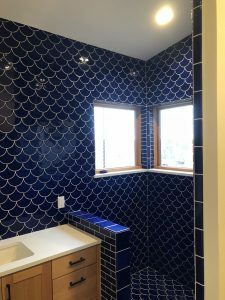 I learned where to find more information on tile installation methods as well as tile, substrate, and installation specifications. NTCA’s Mark Heinlein (l) and CTEF’s Scott Carothers, presented a dynamite training at David Allen Company in the fall of 2018. 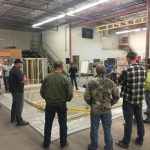 Martin Howard, David Allen Company (DAC) Executive Vice President-Operations, Tile, Stone & Pre-Construction and immediate Past President of NTCA, was over the moon with the Raleigh training. “This event was a smashing success, from the first introduction to the last tool going back on Mark’s truck before heading out of town,” he exclaimed. “The work that Mark and Scott (Carothers, Director of Training and Education at CTEF) and their team did to set up all the work stations, the thought and preparation of materials, tools, scripts – it was all the absolute best event I have ever seen or heard of or could have imagined. We started day one with about 43 attendees including 24 participants and finished day three with 32 attendees and 24 participants. This program never lost any momentum, but just keep getting better with each segment. “These guys worked so hard and long to make this the BEST!” he added. “I can’t thank them enough for investing in this type of training and education. We had 30-year veterans to first-year newbies and they all could not stop talking about how much they learned and how grateful they were for the opportunity to be a part of the event. Another of our experienced lead installers just came by my office to tell me how much they learned. They wanted me to know how grateful they were that DAC values them enough to bring such an outstanding educational experience to them. He also wanted to know how soon we would be doing it again. I told him it would probably be a couple of years before we could get Mark and Scott back, but if he would give me the topics he wanted to learn more about, we would do our own version of this event more frequently. “Creating this kind of hunger for knowledge and training is difficult to achieve, so hat’s off to you guys for making it happen!” he concluded. NTCA Training Director Mark Heinlein reflected on the slate of programs for the last year that culminated in these two NTCA Five-Star Contractor Regional Trainings. 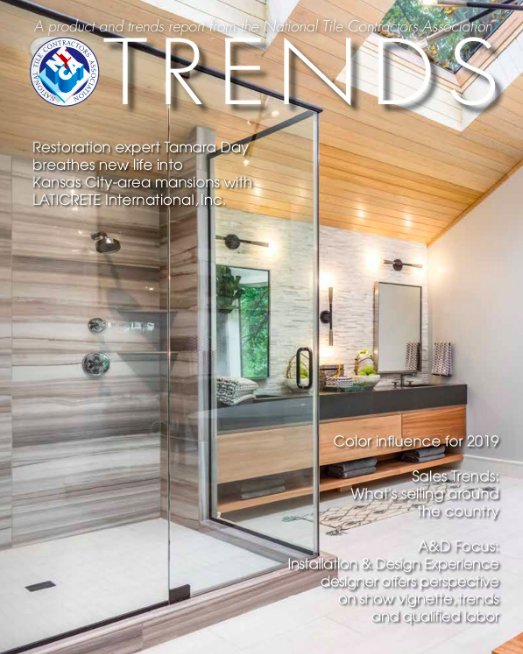 “Whether remodeling a bathroom or producing the next training program, I feel it is always very important to build the current project or program with an eye toward making the next one even better,” Heinlein said. “Much was tried and learned in all of our 2018 programs and the Raleigh program benefitted from those that came before. The new things we tried in Raleigh will be used again and perfected for future programs. Bettiga added that the NTCA Regional Training programs are not simply about training attendees but also inspiring contracting companies to incorporate key concepts into their own in-house training efforts. “Perhaps part of our future efforts can be to provide mentorship, concepts of training, and ways that they can mix online education with these regional training programs,” he said. “We will never become obsolete if we continue to reach out to the thousands of members and potential members in this way, and we will continue of course to update all of our members on new developments, new technology, etc. 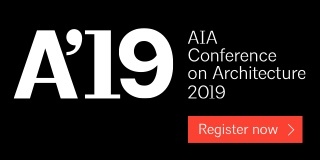 Stay tuned for information about the 2019 schedule of Workshops and Regional Training Events, beginning in February. VCT was exemplary in implementing an apprenticeship program for its company and sharing its process with Thad Russell, Academic Dean, Technical Education and Workforce Development at the junior college, College of the Sequoias. The list of UpSkill Honorees. 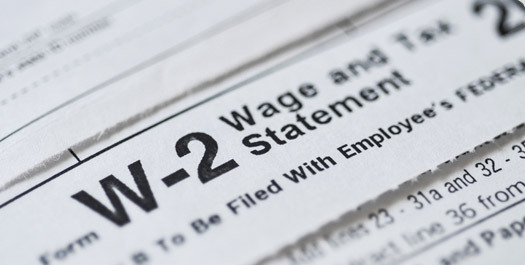 Debbi Barton, Marketing Director and Payroll Manager for Visalia Ceramic Tile, said Russell had been concerned about the lack of apprenticeship programs in construction. 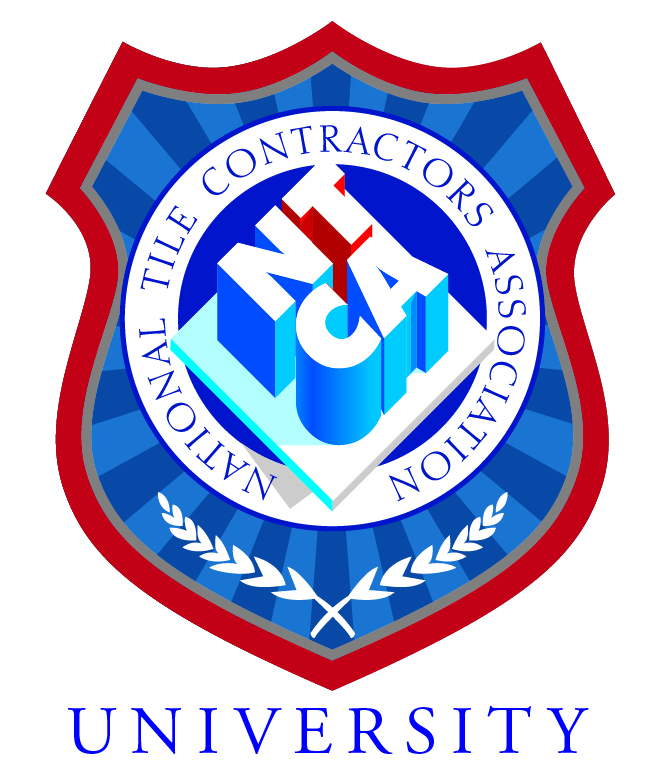 VCT’s Sam Bruce shared with Russell the tile finisher program VCT would be implementing – the online program from NTCA University. Once implemented, Russell was struck by how VCT was enriching the skilled and trained workforce in the community. He explored with Bruce VCT’s experience of getting an apprenticeship program approved. 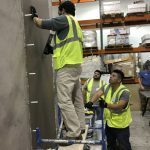 This effort is even more critical since the passage of California AB566 – a new California law that requires 30% of labor on certain projects to have graduated from an apprenticeship program. This prompted many California construction trades to reach out to different organizations and schools to implement apprenticeship programs, Barton said. In fact, it spurred Russell to explore VCT’s program, with guidance from Sam Bruce, who met with other contractors and college personnel to share VCT’s process. 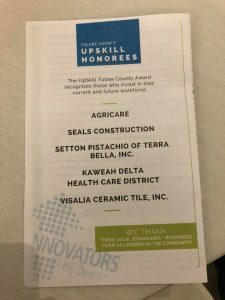 As a result, Russell nominated VCT for the UpSkill Tulare Country Award, which was presented in recognition of the essential effort and information shared by VCT. The award is given by the Tulare County Workforce Investment Board (TCWIB). TCWIB’s goal is to grow skills and talent for the workforce of Tulare County. 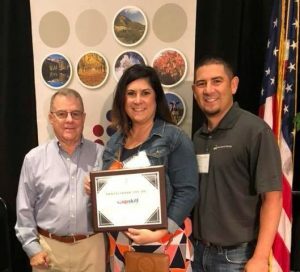 The UpSkill Tulare County Award was presented to (L to R) John Martinho, Debbi Barton and Sam Bruce of Visalia Ceramic Tile to recognize the company for being a quality employer in the community. 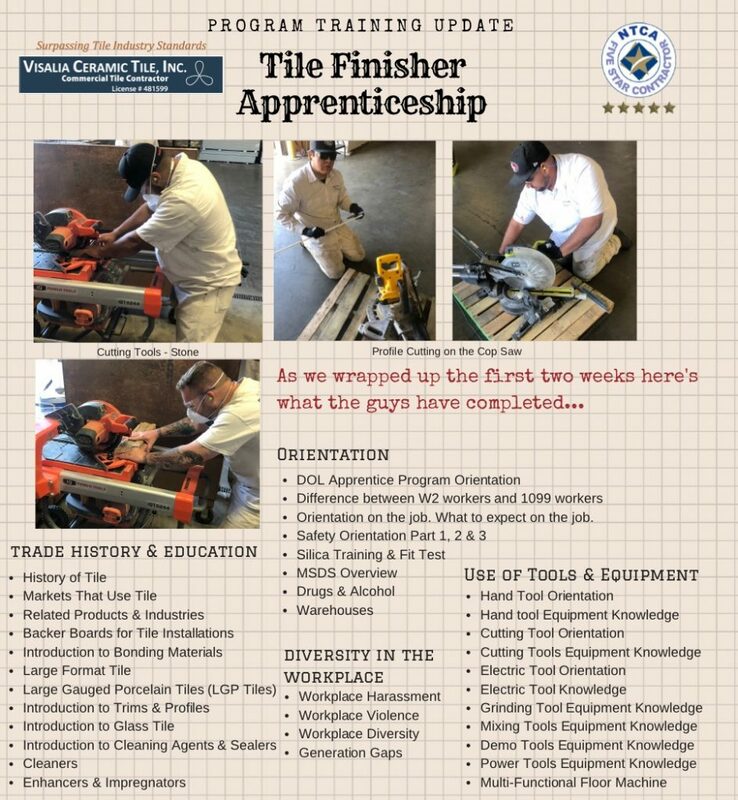 Debbi Barton explained that “Currently we have graduated four tile finishers in the apprenticeship program and have started our next group of four trainees.” Leading this program is Ryan Barton, Training and Development Coordinator/Quality Control. “We don’t want to train tile setters. We want to train the next generation of true craftspeople and artisans. We want to provide them with the skills, knowledge and confidence to take the craft to the highest levels”. 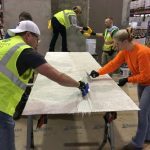 This statement is at the heart of the apprenticeship program that has been implemented at NTCA member Dragonfly Tile and Stone Works, Inc., for nearly its entire 15-year existence. This unique residential contractor in Grafton, Wis., evolved from the reputation Lee Callewaert had built previously in 20 years of high-end, technical and distinctive work in the area. Fifteen years ago, almost overnight, Lee and his wife Jane decided to start their own business to capitalize on a year-long project and also have the flexibility to support and nurture the couple’s four boys. 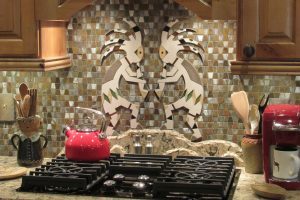 Dragonfly Tile and Stone Works evolved from the reputation Lee Callewaert had built for high-end, technical and distinctive work in the area. Fifteen years ago, Lee and his wife Jane decided to start their own business. Where Lee brought tile trade know-how, a loyal customer base, and a legacy of artistry and craftsmanship handed down through the generations, Jane brought a background and passion derived from corporate training in the medical industry where she blasted into traditionally male-dominated roles in the ‘70s and ‘80s. 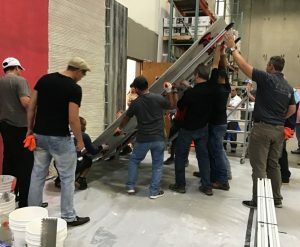 The company began training their own apprentices 14 years ago when they realized it was impossible to hire someone with the particular combination of enthusiasm, interest, motivation, math skills, reliability and trust, detail, artistry, creativity, familiarity with tools, craftsmanship and excellence that high-end customers had come to expect from Lee. 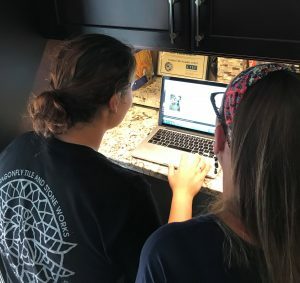 Dragonfly has attracted its apprentices from various sources: word of mouth, a Craigslist ad, a package of information Jane developed for high schools explaining what the tile trade is and what is means to be an apprentice at Dragonfly, referrals, and career days. In recent years, Dragonfly has incorporated NTCA University and its slew of courses into its program. 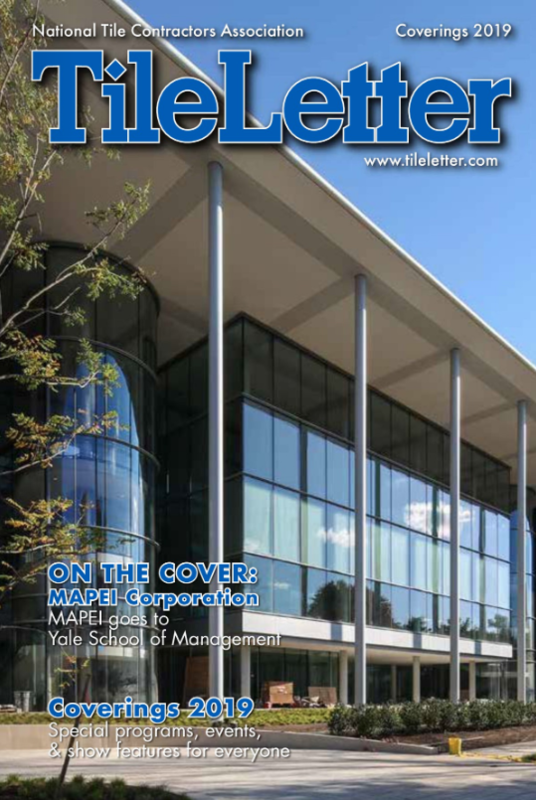 Apprentices are enrolled in the university and use NTCA materials, including TileLetter magazine for independent study. Progress in the program is monitored simply by observations, feedback and nudges to complete the online studies. “They know that their 6-, 9- and 12-month reviews – as well as their compensation – will be dependent on their progress,” Jane said. 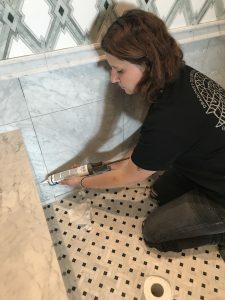 Maria Meyer, 23, made the leap from college studies to tile apprentice with Dragonfly. One of the apprentices currently in the program is Maria Meyer, 23, who hails from Mankato, Minn. She started out studying conservation sciences at the University of Wisconsin, Madison (UWM), and in short order learned it really wasn’t her passion. The training at Dragonfly has laid the groundwork for Maria to be excited about her future, interested in following in the example and level of craftsmanship Lee has set. Maria and Jane with the NTCA University curriculum, which is an essential component of Dragonfly’s apprenticeship program. Jane noted that Dragonfly manages the program with “high expectations. Many young people are not accustomed to that level of personal challenge – being pushed beyond the comfort zone, and at an accelerated pace,” she said. “It can be hard and frustrating for them but has proven to be a great way to help them gain self-confidence. And Lee is pledged to modeling a lifelong commitment to learning, recently taking the Certified Tile Installer exam himself. Meyer enjoys the attention to detail, being creative, and being a spokesperson as a woman in the industry and for peers who are studying art and looking for a creative outlet after graduation. “It takes character and commitment to rise to the challenges they are faced with from day one,” she added. “We are so proud of them and they know we are always there for them at the end of the day.